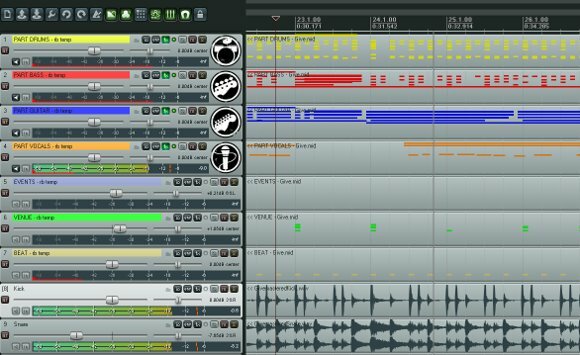 Go from being just a gamer to a creator: a powerful collection of tools let you author every detail of a Rock Band track. Not only does your music appear in the game, but you can – if you like – control even every little lighting effect that appears. Screenshots courtesy Harmonix. Games really are reshaping music. 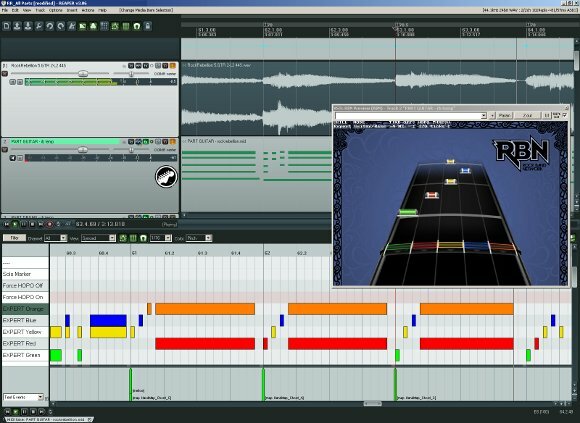 Despite their relatively simple gameplay, the Guitar Hero and Rock Band franchises originated by developer Harmonix are stimulating interest in real music making. It’s no accident that you can walk into a Best Buy and, next to aisles of video games, find a growing selection of serious musical instruments and technology. These titles are also stimulating interest in music and artists and producing a new distribution outlet, at a time when the distribution picture for music can seem bleak. But until now, that outlet has been limited to big acts, big tracks, and big deals with big labels. It has only promoted music you already know, not the discovery of new music. Rock Band Network could change all that. We took a detailed look in August at how Rock Band Network worked technically, and how authoring a song for RBN could give you the same level of gameplay and choreographed graphics that the official Rock Band tracks get. But now here’s the big news: at long last, RBN is opening to the general public, starting with an open beta for artists and play-testers. Coulton “plays” Coulton: Jonathan Coulton and friends play “Still Alive” in its Rock Band iteration. With the help of Rock Band Network, this is just the beginning. Photo (CC-BY) Jacob Davies. What it is: Rock Band Network is a new set of authoring tools (built around Reaper), a submission process (built around Microsoft’s Xbox 360 XNA Ceators Club), and an upcoming store to host indie tracks called the Rock Band Network Music Store. What it costs: Rock Band Network membership is free, but you’ll need a $99/year XNA Creators’ Club Premium account to submit or test music. What it gets you (as an artist): If you make it through the peer-reviewed submission process, you stand to set your own pricing and receive 30% royalties (retail, excluding tax) on everything you sell. What it gets you (as a peer reviewer): With the XNA Creators’ Club membership, you can play as many tracks as you want without any additional charge, in exchange for your feedback. Tired: squeezing into sweaty, overcrowded bars at CMJ and South by Southwest to hear new acts. Wired: Scouting for new acts on your cough with your Xbox 360. And that could make a nice community of music, depending on how this evolves. When does all of this happen? The open beta launches today for peer reviewers and artists. The store is due, um, “real soon now.” (No specific date yet.) The game itself is ready to go, at least on Xbox 360: a patch introduced way back in September added the ability to play RBN tracks. John Drake, Program Manager for Rock Band Network, took some time out to answer my questions on the eve of launch. CDM: What will the Rock Band Network Store look like? Where will you get access to it? Will it be a similar store on the PS3 and Wii? John: The RBN store will run in parallel to the existing Harmonix DLC store, and will be in the same menu location within Rock Band 2. The RBN store has more info about each song than our existing DLC store does, and it has more ways to discover new music: you can search by subgenre, album, country of origin, record label, even the author of the song. The PS3 store will be very similar to the Xbox 360 store. Details of the Wii RBN presence are still being worked out. Ed. note: It’s especially nice to see the RBN store on equal footing. I had high hopes for the XNA-produced games on Xbox Live, but those titles aren’t displayed or listed in exactly the same way, which I think has hurt the initiative a bit. CDM: In addition to the XNA Premium subscription, you still need Windows to support testing your own tracks, yes? Do you need a Windows PC to be a playtester? John: You need to run Windows in order to transfer song files to the Xbox 360, because we use Games for Windows Live to manage the transfer. We have informally tested running Windows on a Mac on a number of virtual machines, as well as BootCamp, and most of them work perfectly for transferring files. Ed. : I can add, a number of the Harmonix guys are Mac fans, so you can believe they tried the virtualization approach! CDM: Since we last talked, there has been a private beta. Were there any additional improvements / changes since our August conversation? What kind of feedback have you gotten? John: The closed beta has been absolutely invaluable to help us shape the experience for the new members just now joining the program. We’ve cleaned up and organized the documents section of the website, added a great deal of new information, clarified policies for submitting songs, and generally made sure that the pipeline is running smoothly. None of the major processes are any different than initially designed, but we have changed a million small details to make it better. It’s important to note that the members that have been in the beta have been absolutely extraordinary: patient, intelligent, hard working, thoughtful, and helpful to each other as they worked through the inevitable issues that cropped up as we readied the site for launch. John: We currently have nearly 40 approved tracks, including tracks by the inimitable JoCo, and a bunch more up for playtesting and peer review. We’re expecting even more great content to go up for testing in the next few days, and we’re excited for people to join our playtesting ranks to get even more songs through the pipeline! John: There’s a great variety of services cropping up from authoring houses offering with different programs to create songs for bands. These range from straight, up-front fee structures to a $0 down, pay us out of your royalties deal. It’s really exciting to see how different groups are responding! *PS, I’m with you on the satisfaction of authoring. I’ve been working with my band to put our whole last and current record (17 songs in total) up for RBN. It’s a lot of work, but it’s super rewarding to get involved in the process! And it’s really doable if you’re used to making music as a passion! John: It was always the intention that the tools we developed for the Rock Band Network would be integrated internally at Harmonix and that has begun to happen. With the industry leading amount of content we produce (over 1000 songs and counting) anything that makes the job of our unparalleled Audio Team easier is welcome, and in most cases the Rock Band specific tools were built by members of the Audio Team themselves! CDM: Okay, enough of the nit-picky details… what’s it mean for you that you finally get to take this to public beta? Now with a few months more perspective on it, what do you think this will mean for musicians to get on this platform, revenue aside? John: As our Senior Producer Matthew Nordhaus said about Rock Band Network, “It completes me.” We’re already thrilled with the community working within RBN and we’re hopeful to see a lot more great content and enthusiastic playtesters signing up at Creators.RockBand.com now that we’re open! Additionally, we’re really proud of our teams here at Harmonix and MTV Games, who have designed a really smart way of getting great music into the hands of fans. Empowering musical groups of all sizes and genres to be able to post their own content for sale is really a dream come true at Harmonix. Adding the great variety of music for our passionate fanbase only makes it that much sweeter. We’ll be even more excited when the store turns on and those first tracks sell! How to become a peer reviewer? And yes, I still want to see an Amplitude/Frequency Network that’s friendly to electronic music, minus drums + guitar. I think Harmonix knows a few of us feel that way. Jonathan Coulton on Rock Band Network, from the awesome PAX. PAX ’09 Rock Band Network Panel #3 from Harmonix on Vimeo.